Rafi Sings For Kishore. We will continue the topic of Rafi Saabâ€™s duets with other male singers in the subsequent parts. But, today, let us take up another theme! The one thing that puts die-hard Kishore Kumar fans instantly on the defensive is the fact that MDs had made Rafi Saab sing at least 6 songs for Kishore Kumarâ€™s acting! This is quite a remarkable occurrence considering that Kishore too was an accomplished singer! Both the Rafi-Asha duets from Bhagam Bhagh (1956) mentioned above are very nice ones, especially the Song No. 1, â€œHamhe Koi Gham Hai, Tumhe Koi Gham Haiâ€. In this duet, O.P.Nayyar makes good use of duet bits of Flute and Harmonium to very good effect! â€œHamhe Koi Gham Haiâ€â€”Bhagam Bhagh(1956)-Listen and enjoy! Next, both the solos by OPN and SJ from Raagini(1958) and Shararat(1959) respectively are indeed very great ones! But, let us choose today the Raagini solo, â€œMan Mora Banwara, Nis Din Gaaye Meet Milan Keâ€, composed by OPN. This solo is a semi-classical composition penned by Jaan Nissar Akhthar. A great, divine rendition by Rafi Saab indeed! Finally, though I am no great fan of post-1970 songs, let us also discuss the Rafi solo for Film:Pyaar Deewana(1972), composed by Lala Sattar and also lipped by Kishore Kumar. This too is quite a nice composition. However, one wonders why Rafi Saab was made to sing for Kishore Kumar even in 1972, by which time Kishore Kumarâ€™s singing career had really looked up! Please hear and enjoy the audio above, and video below! 1.Complete the entire buffering and then only listen! 2. Listen to each complete song at least twice, to get a complete feel! This entry was posted on Sunday, January 20th, 2008 at 8:51 pm	and is filed under Audio Songs, Video Songs. You can follow any responses to this entry through the RSS 2.0 feed. You can leave a response, or trackback from your own site. this song, there was one more Sharatat Rafi /Lata that was lip-synced by Kishore and the female lead . Rafi Ka Jaadu – Awards – 2nd part (April 24, 2004). Rafi Ka Jaadu is now co-hosted. Along with me, I have another Rafi fan, Priya. Who is this Priya? Is it U, a Rafi fan? Priya Sanyal…..Have you seen EK RAAz where Kishore was singing clasical song. Have you noticed Tum bin jaon kahan was more popular song than Rafi’s same number picturised on Shashi Kapoor, the hero of movie. That doesn’t mean that Kishore was better than Rafi or Rafi was better than Kishore. They were equally good singers and I tell you in those days and even now I love listening to Rafi’s songs because it was mostly Rafi who was playback singer, not Kishore. Who knows “Ajab hai dastaan or any other song was given to Kishore would have been equally popular. What I am saying is that in those days Kishore was more busy in acting and not considering much in playback except for few great numbers of Dev Anand. So one shouldn’t compare that Kishore won’t be able to sing those songs when it was not given to him by Mds. I heard Lata once said that if Kishore only sticks to playback then he will be a great singer which Kishore accomplished at later stage. One shouldn’t compare these great singers who is better than others. Some likes to listen mostly of Mukesh, some Talat, some Kishore, some Rafi. I like listening to all singers and especially Rafi’s old numbers, because Kishore was not a playback singer then, and Kishore’s latest numbers (70’s, 80’s) as Rafi was not given much to sing at latter stage by music directors. Keep listening to good numbers and shouldn’t compare who is better and who is not as they are equally good. In old films there were quite a few classical songs but trend changed at latter stage and that is the reason we will have mostly Manna Dey and Rafi with very good classical songs. Regarding Ajab hai Dastan Shanker (SJ) had commented, “No doubt Kishore Kumar is a good singer. He sang beautifully for me in Rangoli. But Ajab Hai Dastan was simply not Kishores cup of tea. The mukhdas and antaras required a singer of Rafis range and classical background”. This goes on to say that it was not an off case.The way Rafisaab raises his pitch without any effort Even if the song would have been picturized on some other actor other than KK, it would have been sung by Rafisaab only. Now about Op nair story is concerned,,,Nair bad phase started with that day,,n got such a infamy in film industry as he behaved that way with one of the most punctual person of Film world inspite of his sk jk reasons in the context..However,late is late but in this case,Rafiji was only a playback singer so could be replaced,,,,but in Aajab hai dastan,,,Kishore kumar was not only playback singer but also actor of the movie,,if u know little about film world,,u would come to know that its mainly actor who determines who would give voice to him,,sometime actos choice overpower that of mus dir or producers of the movie….Ignoring kishore`s position kishore was ignored with singinging,,,,I don`t say its something good that happened as I don`t hate Kishore kum,,but it was really a thing that happened ,,n u can never ignore it that its the voice of Rafiji,,in about 20 songs in which Kishore kum was dancing and animating…. Arghya I`ve read ur discussions with a rafian Savita Garcia whom u called ur elder sister n I`m really hapy to observe that though u r a die hard kishore fan, u also have great respect for Rafi ji n acknowledge laters greatness.And its really appriciating that its u who has taken responsibilty to run a kishore kumar faoundation as there r many other Kishore fans who r quite arrogant n visit this site only to prove Kishore`s suprimacy and to disturb Harmony of this site…..
Now as far as ur story of Ajab hai dastan is concerned,,,,ask urself,,, is only late the reason for swictching over to Rafi ji,,,,,,Kishore kumar was never on time(excpet few exceptions).Kk was one of the most un-punctual person that Indian film industry has ever seen and also was least discipline while recording song,,don`t take it as criticizm as he used to hold humour at place of discipline,,,for us n co singer humour or carelessness can be taken easily but never for professional music directors…….when music diretors of 70s started trusting Kk`s abilty for type of tune that was prevailed in 70s,they never bothered for his carelessness,,his demand of high amount of money,,,etc etc,,but why they bothered that much while recording in 50s or 60s,,the reason is clear boy,,that they didn`t trust in kishore voice in that era,,,,,its the fact that u can never deny….And also we have nothing to do with such story about kishore kumar as we r really concerned mainly with Mohd rafi sahab and his divinity to be discussed here. So S-J couldn’t wait for Kishore as they are very busy. Same thing was done to Rafi when he turned up late for OP Nayyar’s recording. So he replaced Rafi with Mahendra Kapoor. Later on they patch up. So one will notcie that movies like Kismat, etc have Mahend Kapoor instead of Rafi who was all the tme was singing with Asha for OP. S-J also depends on Rafi and Mukesh. It is no doubt that Rafi is a great singer and I believe in his young days he had some training from other Ustads. Manna Dey is also very good singer and excels in classical songs. Kishore and Rafi will be close and on other hand Kishore is also also a versatile singer who can sing sad and as well as happy songs. No one is superb as Kishore in Yodelling. I don’t think he had any training from Ustad but was tallented enough. Once he started concentrating only in singing after Madhubala’s death, no one could catch him as he was giving so many hit songs and most actors wanted him for their background. When Kishore is busy in acting and shooting far away on locations then he had no time for recording. In those circumtances, Shankar- Jaikishen won’t waste time for waiting as the songs should be ready for shooting next scenes. They also have other movies in hand for directing music and songs. So he will have, Rafi, Manna Dey or any other singer to get his task done. Same applies to OP or other music directors. Thus you will see Rafi, Manna Dey (Din albeli..) singing for Kishore. 1. Venkatadiri sir..You have forgotten another film where rafi playbacked Kishore, ie, Baaghi Shehzada (1963) for Rafi-Asha duet composed by Bipin-Babul. 2. Binus 2000 sir: The story of “Ajeeb hai Dastaan Teri zindagi” is not perfectly true. Yes, at first, SJ gave the song to kishore. One day rehearsal took place and the following day was the recording when Kishore, known to his eccentricities, did not turn up for the recording on time.. SJ were kept awaiting and they became furious and immediately called rafisaab.. Wehn Kishore turned up the following day, he found the entire song already recorded by Rafi.. Immediately realizing what mistake he had committed by playing this eccentricity, he apologized to SJ and requested them to record the song again with him as he was confident of the song.. but SJ, already so angry, did not listen to his request… so, it became only one-off song where SJ used Rafi for KK under critical circumstances, before Sharart-the movie this song belongs, they composed in New Delhi for kishore but did not use any other singers. Even after Shararat, movies like Krorepati(1961) and Rangoli(1962)- the Kishore starrers, they used only kishore to do his won playback.. Yes in Man Mora Bawra, O P Nayyar intentionally used Rafi for kishore as OP was not confident on Kishore’s abilities to render classical number.. But “Ajab Hai daastan teri” was not an intentional but circumstantial decision..So, let us not spread wrong stories on this..
a song in the seventies as well. tried in Kishore das voice but was not coming perfectly. its said that kishore da told s.j. : now please call the boss at 4.00 p.m.
rafi saab walked in and within 2 hours the song was okayed. well i like reading this article but i want to say something!!!!!!!!!!! as u have written than rafi saheb have sung more than 6 songs for kishore da, very true as a matter of fact kishore da was very busy those days (acting & singing) that he didn’t got time to sing all the songs. well just leave this stuff and in my opinion it’s very bad to compare them both are gems of india. know any other singer and I did not want to replace him. Rafi Saab is the “Ustadom ke Ustad”. i am waiting for a great thing to happen. place in the hearts of millions of his fans across the world. I THINK WE SHOULD HAVE RESPECT FOR ALL AS A GOOD HUMAN BEING AND ALWAYS RECOGNISED AND GRATEFUL TO OTHERS WORK WITHOUT ANY CONSIDERATION. we should not compare two great singers,mohd rafi is the gift of God to bollywood. Kk is great be great i am a Mohd rafi fan and Lata ji. The song no.s 2, 4, 5, 6 ,7 and 8 (6 songs) in your list are definitely the ones wherein Rafi Saab lent his voice for KK. Similarly, song no.s 3 and 9 also appear to be true, though a bit uncertain still. Song no.s 10 and 11 seem unlikely. Incidentally, a couple of corrections. Song no. 4 is not a Rafi solo but is a Rafi-Asha duet. Similarly, song no. 7 is also a Rafi-Lata duet and not a Rafi solo. It starts with Lushka Lushka Lushka…. All the same, many thanks for the new inputs. I am a Great Rafisaab fan and I will always see Rafisaab as the best singer the industry has ever had. For me k.k was not as talented in singing as rafisaab was, however, k.k had his own talents and therefore should be credited for that and not always being compared to rafisaab. rafisaab will always be the greatest singer in hindi playback singing! so, all fans out there just follow your heart and respect and appreciate the one that you love. Back to this VERY INTERESTING topic. The first Rafi song on Kishore I saw was Apni Adat. Amazed at how well Rafi suited Kishore Kumar! Being so familiar with Kishore’s voice – I thought it’d look out of place to put another voice on his face. Amazing! That has to be among my favorite sights in HF. Rafi’s versatility had no limits – whether it came to suiting actors or songs. As cliche as this is – it is proven again and again every single time. He perfectly adapted his rendition for the actor in mind. Rafi Sahab is being playful and comic just like Kishore for “Hame Koi Gham Hai” ; “O Meri Maina” ; “Apni Adat”. Yes, I had waited years to see that picturization and thanks to mohanflora sahab at hf – I did. These videos / songs were not easy to find so I thank venkat ji for bring attention to them. They are indeed rare diamonds that should not go lost. ref #8 – yes binu ji – you can be respectful & fond of someone AND also be able to **respectfully** raise an objection as kishore did about lp giving rafi the best songs. it is no secret that lp’s favorite was rafi. consider that for 23 long years kishore struggled to make it big in the cruelly competitive & whimsical hf industry and finally he does. at the same time – rafi sahab (who worked his way up too) – is revered by the greatest mds that ever lived. so after all that, surely you can’t blame kishore for being watchful of his career and tunes given to him. i doubt kishore was asking for too much – there were probably just a fraction of tunes that he really liked and wanted to sing himself. doesn’t this ALWAYS happen among singers (and often times it isn’t as clean as it was with kishore). put yourself in the other singer’s perspective and not always that of a rafian! ref #12: yes venkat ji you are correct on both accounts. just the clarify – the second letter is NOT an m as it is for someone else. Your line about ‘90% of posts’ makes me think that you and I frequently meet elsewhere! Does your name/ID there start with an ‘M’, by any chance? Let this pass, if you do not wish to reply! jannat se aayi hui wo haseen awaaz hai. Infact there are many songs both the legends could have sung but some are most suited for rafi sahab where it has classic touch or for that matter nafrat ki duniya kind of song. ref #2 – hussein sheik – why can’t rafi & kishore fans get along? with self discipline in being clear about what is subjectively personal and what is absolute – they should be able too! for example, if a kishore fan doesn’t care for classical songs (sort of like me) – he should just say that another singer being better suited for classical fans is irrelevant to this particular fan as he cares only for pop songs etc. given how great & accomplished both artists were – there is never a reason to put down one’s ability to raise the other (and luckily that has not happened here). ref # 5 vikas sharma: the rare diamonds series is about RARE songs – rafi – kishore duets were often very high profile & famous so they are not as rare. in any case – i want to talk more about that subject later. fans and sigers of kishore kumar saaab do visit here…. they have praised this website many a times. times KK would call rafi for recordings, due to this. L & P that : “good songs u always give to him”, meaning rafi. it would be nice to know ur name : kishore fan…. Yes, I agree, Kishorefan, that actually only the two solos from Shararat (Ajab Hai Dastaan) and Raagini (Man Mora Banwra) did really need Rafi Saab to sing for Kishore. Hopefully Rafi fans will admit that many compositions did not make use (hence did not require) the **FULL** ability of maestro Mohammed Rafi Sahab. Extreme example “Nothing Is Impossible”. Legends like Rafi & Kishore should not have been asked to sing that. 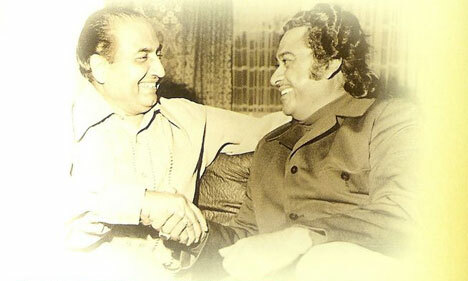 “Man Mawra Banwara” and “Ajab Hai Dasatan” required Rafi Sahab’s unique abilities – so I can understand if MDs used Rafi for Kishore on that song. However, the remaining songs of Rafi on Kishore – did not require the FULL abilities of Rafi Sahab and THEREFORE would have done just as well if rendered by Kishore. Of course Rafians will prefer a Rafi rendition because his voice is closest to their hearts but that is subjective and to one’s personal choices and a Kishore or Mukesh fan would feel similarly. This subjectivity is only lost out of reasonable range when you’re talking about a song like “Mera Naina Sawan Bhadon” (I love Kishore – but this was for Rafi & only Rafi) or something like “Tere Mere Sapne”. Coming to my point, MDs like SJ were too too biased in favor of Rafi for a song like “O Mere Maina” by having the maestro sing the 3rd stanza. It wasn’t needed – Kishore could have definitely sang that part himself. The same for “Hame Koi Gham Hai” and “Apni Adat” (latter was a simple song to sing). Clearly the MDs had a blind eye for Kishore Kumar during that time which is unfortunate. Rafi fans should not use songs like “O Meri Maina” or “Apni Adat” to suggest Kishore couldn’t render them and so they needed Rafi. It was more about MDs underestimating Kishore Kumar than about musical ability. Or in one case it was KK showing up late and OPN punishing him by having Rafi. Binu Nair is a good man – I genuinely appreciate his hard work on the Rafi foundation and his enthusiasm for Rafi Sahab. But Rafi fans – please don’t hold it against Kishore for being a Rafi fan. Many times if KK referred a song to Rafi Sahab – it was more about of love, respect, and humility with regards to his co-singers than him not being able to sing the song himself. He could have successfully rendered those songs himself and during his peak wave – good bad or whatever (subjective to fan’s choices) – they would have been huge hits. If anyone (I say this in general terms – no specific target or instance – this is a GREAT web page) were to take advantage of Kishore’s love & respect for Rafi – it would deeply upset Rafi Sahab himself. Venkatji – please continue with your articles. As a Kishore fan I have NO complaints or anything – just a healthy discussion of legends. I only posted this to express a few of my thoughts that you reminded me of. Thanks. OH WHAT A GREAT CHEMISTRY THE TWO PHENOMENONS OF INDIAN FILM PLAYBACK SINGING RAFI SAHIB AND KISHORE DA SHARED WITH EACH OTHER. arshad bhai is right. the film must have been made in the 60s and released later in 1972. Kishore da might have been going through a series of flops and asking Rafi saab to sing for him was natural. Anyway, he was always the no. 1 rafian. I want to share with you a clip from Bhagambhag where Rafi saab and Kishore da sang together under op’s baton. Please read the comments of the viewers; very interesting. How I wish Rafi saab appeared on screen with his chhota bhai on screen just for this song! the film Pyar Deewana though released in 1972 must have got its release delayed. The setting in the song and the faces of the lead pair confirn that the song must have been picturised in the mid 60’s.Furthermore the MD is a lessor known Lala Sattar.Rafisaab must have agreed to sing the song for a token fee. The song itself is nice and catchy and definitely of the mid 60’s. Interesting article, songs mentioned are so nice. I am sure KK fans are not happy with this article, but fact is fact. Rafi Saheb, a true Bharat ka Ratna. 1.-What a nice topic and collection you chose and presented…just superb..my compliments..Rafi saahab was just great..MDs have tried all sorts of experiments through Rafi Sahab..& Rafi Sahab did full justice. touched the hearts of the audience while watching the movie in a theatre. 3.-Enjoyed your all the articles.